Don Edmunds was an American racecar driver and car builder. He got his first start at Indianapolis Motor Speedway in 1957 and won the 1957 Indianapolis 500 Rookie of the Year after finishing 19th over Bill Cheesbourg, Elmer George, Mike Magill, and Eddie Sachs. Edmunds’ Indy career ended in a serious practice accident at the Speedway in 1958. 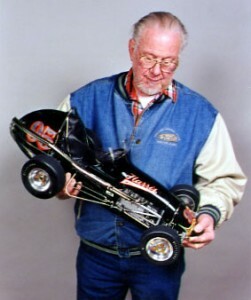 He founded Autoresearch, Inc. in Anaheim, Cal., specializing in building midget and sprint cars. His chassis won several National Midget Championships in the late 1960s and early ‘70s. He became a collector and restorer of old race cars and built Evel Knievel’s Snake River Canyon Sky cycle..